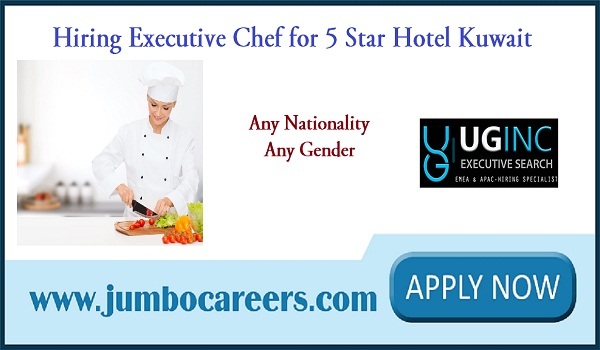 A leading 5 star hotel in Kuwait requires experienced Executive Head Chef (Indian Fusion Style). About the company : UG INC. is an executive search firm established in 2007 with core expertise in retained, contingency search models of C- Level to top down positions in EMEA & APAC Region. They have numerous blue chip clientele based in Kuwait, Bahrain, UAE, Oman, Qatar and Saudi Arabia. They register a constant stream of positions with many of the biggest names in recruitment across in United Kingdom, Canada, USA, Poland, Ukraine, Romania, Brazil, Mexico, Colombia, Cuba, UAE, Qatar, Kuwait, Pakistan India, etc. as well as a significant number of respected small to medium sized organizations. * Hiring Executive Head Chef (Indian Fusion Style) with over 15 years’ experience in 5* Star hotel in GCC/ UAE. * Should have experienced in menu engineering, P&L, food costing, etc. Must have strong experience in Indian fusion dishes.